We are in a countdown around our house. Mims has just a little less than 3 weeks before she heads off to Kindergarten. I've been gathering school supplies over the last couple of months as I find things on sale, so we're pretty set as far as that goes. My gut instinct is to hoard school supplies, since crayons are so cheap this time of year (and so expensive all the rest of the year!). Aaaand, it the best time of year to pick up pencil cases. What?! You don't have an absurd number of pencil cases at your house? I'm the only one?! I use them for everything. I love them! I use pencil cases for carrying small projects. I use them instead of a tool case for carrying my crochet supplies. I have one that holds all my watercolor brushes. I use one to carry my art pens. I keep my beads in a hard plastic pencil case. In fact, I keep my current bead projects in individual pencil cases, so that I can have the tools, and beads all in one place (I usually put a washcloth in first, so the beads don't roll around as much). I flippin' adore pencil cases! My love of pencil cases started when I was in college. I was a tutor for a college success class, and I insisted that my students all had to have their pencil cases in order. There was a whole checklist that they followed: Erasable pens, a multi-color 'clicker' pen, Post-It notes and flags, index cards, $3 (two $1 bills and four quarters). I owe all of my own college success to a well organized pencil case, and excellent note-taking skills. So it will come as no surprise that recently I have fallen in love with a new shape of pencil pouch. I picked one up for $5 (on sale) and just adore it. 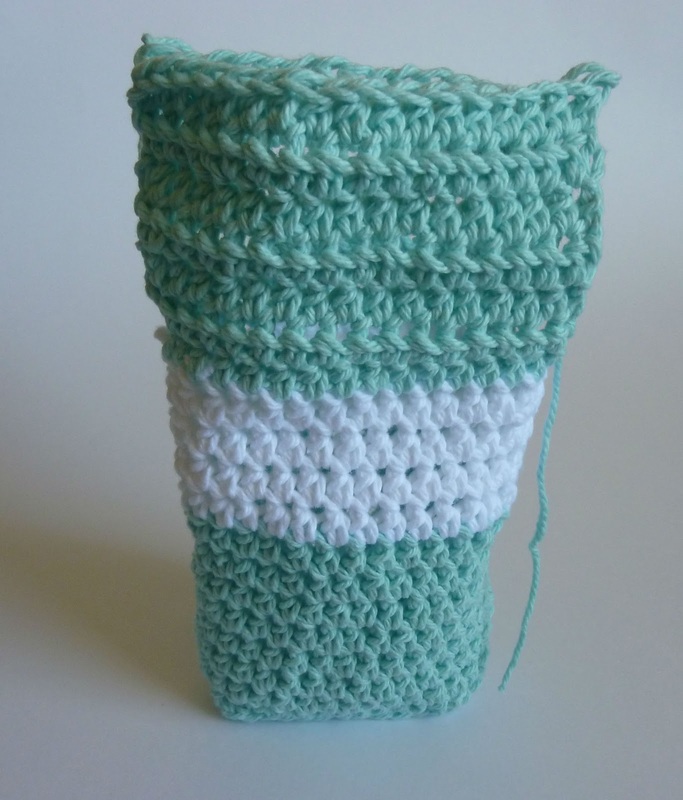 I've been using it to keep all my embroidery floss together for my miniature crochet. It's a perfect size for a small pair of scissors, my hooks and 'little extras' to go with whatever project I'm working on. I couldn't rationalize spending another $30 to get a boatload of them to use as a crochet organizational system, but I had a bunch of worsted weight cotton yarn, and some fabric just laying around (see, I need an organizational system!) and decided to make some of my own! 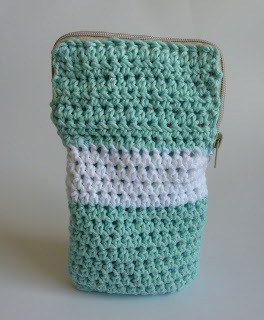 Today I'm going to share the pattern for the crocheted outer shell of the pencil case! Come back on Sunday and we'll put the lining and zipper in using the Knit-Picker! If you'd like an advance list of supplies for the lining/zipper post, I applaud your dedication! I used a sewing machine. It would be possible to do the sewing by hand, but it would be laborious. A zipper that can be cut down to 12.5"
ed. 8/19/12: The two-parter has become a trilogy! You can find Part Two HERE. And Part Three HERE. Yay! more knit picker projects! I ♥LOVE♥ the fabric for the lining! Ooh, I know, right?! The lining fabric is awesome. I want to make Mims a dress out of it. I am excited to see the knit picker in action also. Hi Piper!! Workin' on the tute right now! Thanks Aly! So happy you stopped by! I'm new here---what is a knit picker??? Hi Pam! We love new friends around here! A Knit Picker is a little latch-hook tool that is made by Dritz. You can find them in the notions section of most sewing stores. 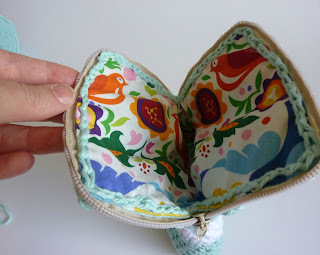 It was designed to pull snags from knit items to the inside of the fabric. 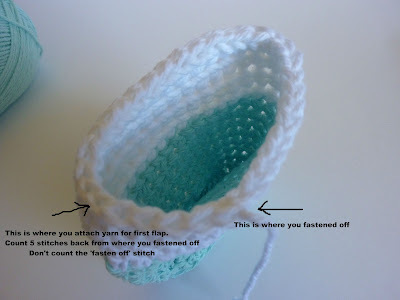 That post has a bunch of pictures so you can see the Knit Picker in action. Great question! I hope we'll see you around a lot more!